Research suggests that athletes and those who exercise intensely lose many critical vitamins and minerals from training, particularly B vitamins, vitamin C, chromium, selenium, iron, and copper. This is due to a variety of factors, including the loss of minerals in sweat and urine, their increased use for energy production during workouts, and their increased use for recovery and protein synthesis after workouts. Therefore, it's very beneficial that you get at least the Recommended Dietary Allowance (RDA) or Daily Value (DV) for most minerals, and get far more than these recommendations for most of the vitamins and specific minerals for optimal performance and physique changes. Another common missing or under-dosed micronutrient is iodine, which is critical for maintaining healthy thyroid function. Since most of the earth's iodine is found in oceans, iodine deficiency is an important health problem throughout the world. With the wrongful demonization of salt/sodium, few people salt their food today, and many restaurants use far less salt in their dishes. The problem with this is that table salt is iodized to prevent iodine deficiencies. Research suggests that diets that exclude iodized salt, fish, and seaweed have been found to contain very little iodine. In fact, studies suggest that iodine intakes have declined in the U.S., Switzerland, and New Zealand. If your multi doesn't deliver iodine at 100% of the DV or RDA, it's a problem. Chromium is also absent or severely under-dosed in many multis. This is problematic because the average diet is low in chromium. 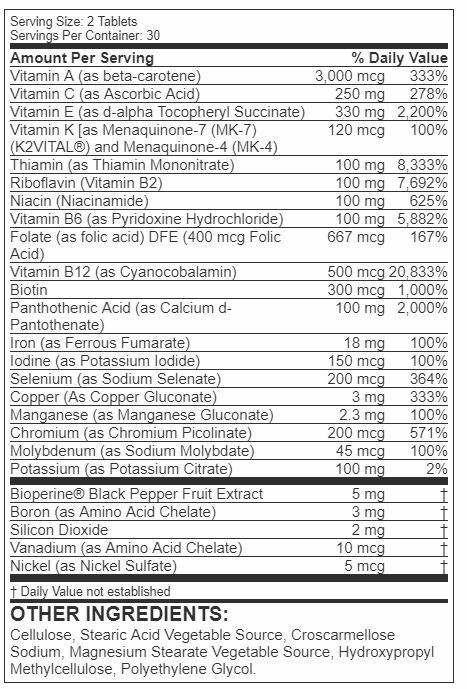 You could take a separate chromium supplement, but chromium is actually best utilized as part of a multivitamin because uptake is enhanced when chromium is taken with vitamin C.
Copper is another missing or under-dosed mineral. Since higher intakes of zinc can lead to copper deficiency, and you should be certain to get 15 mg of zinc daily separate from your multivitamin, it is important to get an adequate dose of copper (2 mg). Other minerals that are also often grossly under-dosed in multis include selenium, molybdenum, and manganese. These minerals and vitamins should be included at a dose that provides at least 100% of the DV or RDA for them. Directions For Vita JYM: Take 2 tablets with a meal such as breakfast every day. Warnings: Do not use if you are under 18 years of age, have any known or suspected medical conditions, and/or if you are taking any prescription or OTC medications. KEEP OUT OF REACH OF CHILDREN. Store at 15-30°C (59-86°F). Protect from heat, light and moisture. Do not purchase if seal is broken. PROP 65 WARNING: This product contains a chemical known to the State of California to cause cancer, birth defects or other reproductive harm. WARNING: Accidental overdose of iron-containing products is a leading cause of fatal poisoning in children under 6. In case of accidental overdose call a doctor or poison control center immediately.